We’re ready to set out on the trail of another exciting year of home shows! 2017 has us visiting some of our long time favourite shows, with various Timber Kings and the Cedar Rocket in tow for many of them! Our season kicks of at the Barrett Jackson show in Scottsdale, Arizona, January 14th to 22nd, 2017. Company founder, Bryan Reid Sr. will be attending for the duration of the show, along with the infamous Cedar Rocket! 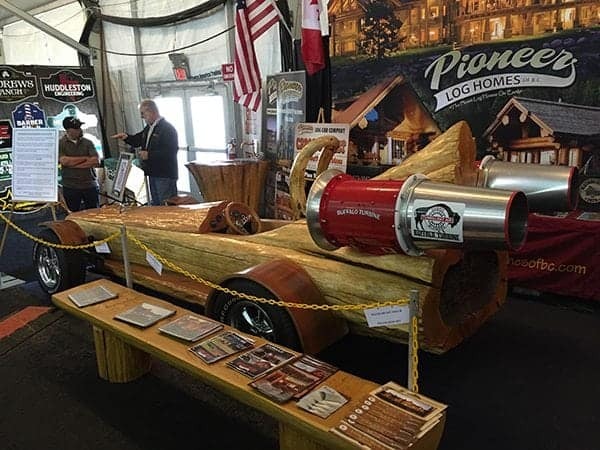 Come by booth 11-HIJ and chat with Bryan and the crew about your log home, and get your photo taken with the Rocket! Can’t make it to Scottsdale? Bryan and the Cedar Rocket will be at Safari Club International’s 2017 Convention in Las Vegas, Nevada from February 1st to 4th, 2017 as well. Visit them at booth 3450! Our Canadian home show season kicks off in March, with Mike Jacobson and his team visiting the Calgary Home and Garden Show from March 2nd to 5th, 2017. Come by and say hi at booth 856. The Canadian team will also be off to the Saskatoon HomeStyles show March 9-12, 2017. Timber King André Chevigny will be speaking at this event on March 11, 2017 – after watching his presentation stop by booth 328 to chat about your log home plans. For a full list of American and Canadian shows, see our full home show schedule here. We look forward to meeting each of you at our various home shows this year!